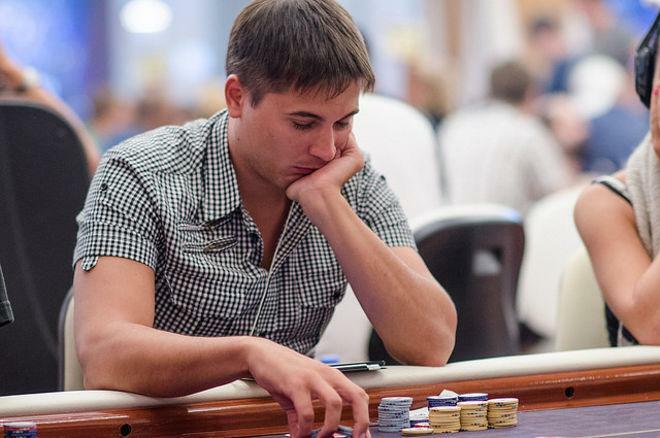 Artem Vezhenkov has two Sunday Million titles and multiple Super Tuesday wins. Now he has a WCOOP victory. Day 3 of the 2017 PokerStars World Championship Of Online Poker (WCOOP) saw another seven champions crowned and six more events play out the first of their two days of action. The biggest cash haul of the day went to Russia's Artem "veeea" Vezhenkov, a talented tournament player who has won two Sunday Millions and multiple Super Tuesday events at PokerStars. Now Vezhenkov can add a WCOOP title to his long list of poker-related accomplishments because he triumphed in the WCOOP-06-H: $1,050 NLHE [Progressive KO] event. A total of 1,221 players paid the $1,050 buy-in for the sixth WCOOP event of the series, creating a guarantee-busting prize pool of $1,221,000, half of that impressive sum going to the regular prize pool and the other half being used for the progressive bounty payments. The nine-handed final table began with Spanish superstar Adrian "Amadi_007" Mateos in pole position with more than 14.1 million chips and his nearest rival being "James" of Brazil with just over 10.55 million chips. Bringing up the rear was Andreas "daskalos20" Christoforou and it was he who was the first player eliminated from the star-studded final table. Christoforou busted in cruel circumstances after committing his stack with a turned full house only to lose to James's better full house on the river. Finland's "elemerixx" was the next casualty, his red sevens being no match for the black kings of "PSMozak" before Jussi "calvin7v" Nevanlinna sent his bounty to Mateos when his pair of jacks were cracked by Mateos' suited ace-six courtesy of an ace making an appearance. The tournament lost a dangerous player in sixth-place when Alen "lilachaa" Bilic four-bet shoved with king-queen only to see Mateos call with ace-jack. The door card was the jack of spades and Mateos improved to unnecessary trips on the river to reduce the player count by one. Vezhenkov then took up the role of executioner to send Latvia's "sleepnot" to the rail and then crack Mateos' pocket aces with a pair of sixes thanks to those sixes flopping a set. Not only had Vezhenkov stolen the chip lead with only three players left, he had eliminated arguably the best poker player at the table in Mateos. Yet another bounty went Vezhenkov's way when his pair of fives prevailed against James' king-seven and after a 45-minute heads-up battle with PSMozak, Vezhenkov was crowned the event's champion. The final saw a brief raising war result in PSMozak being all-in with and Vezhenkov's needing some help. That help arrives on the flop and when the turn and river fell and , Vezhenkov had all of the chips in play. Amazingly, Vezhenkov's bounty payment was more than he won for taking down the tournament. The Russia amassed $100,514 in bounties, with Mateos being his nearest rival in this respect with $16,164. Vezhenkov is now tied for fourth place on the WCOOP Leaderboard where the winner secures the Champion's Trophy, a PokerStars Caribbean Adventure package and $20,000 cash. Topping the leaderboard right now is "elemerixx" who finished eighth in the event Vezhenkov won. The Finn had a profitable day at the tables on Day 3 because he also finished third in the WCOOP-07-H: $530 NLHE [8-Max] for $49,253 and now has 125 points. ... Austria's Pascal "Paffchen" Hartmann took down the WCOOP-05-H: $215 PLO [6-Max] for $37,014 with Croatia's "josip1313" triumphing in the WCOOP-07-H: $530 NLHE [8-Max] for a cool $93,988. .. Day 4 sees the three high events play to a conclusion, including the half price Super Tuesday that will award almost $200,000 to its winner, while three low events will also crown their champions.